Organizations have many different approaches at their disposal to build and deliver solutions right. To be truly effective, organizations need to deliver the right solution, when solution delivery is warranted. Effective Product Ownership is the collection of customer-focused skills and techniques that organizations and teams use to determine the right things to deliver. Discuss key aspects of agile and identify your current environment. This helps to set context for the rest of the workshop. Discuss the current roles in your organization, their responsibilities, and how they correlate to common practice. Learn techniques to understand your organization context and use that understanding to make better decisions about your initiative. Outcome is the change you wish to see in the world or your organization. Output are the things you deliver to realize that outcome. Progress and success is often defined and measured in terms of output. You’ll be much more effective if you focus on outcome instead. Use the problem statement to collaboratively identify outcome. Use goals, objectives and decision filters to describe your desired outcome. Analysis techniques coupled with roadmap planning and backlog refinement can be very powerful means of building and maintaining a shared understanding among everyone involved with an initiative. Scope the initiative – Establish and communicate clear boundaries for an initiative. Define the solution – Model a big picture view of the solution and identify specific backlog items to deliver the solution. Describe the solution – describing aspects of a solution via acceptance criteria, examples, and models. Reflect and Adapt – Elicit and utilize feedback from stakeholders and implement functionality incrementally to keep continued focus on value. Teams cannot be truly effective unless someone makes clear decisions about what they will and will not deliver. You’ll learn how to be an effective decision maker, or to ensure that informed decisions are made in a timely manner. 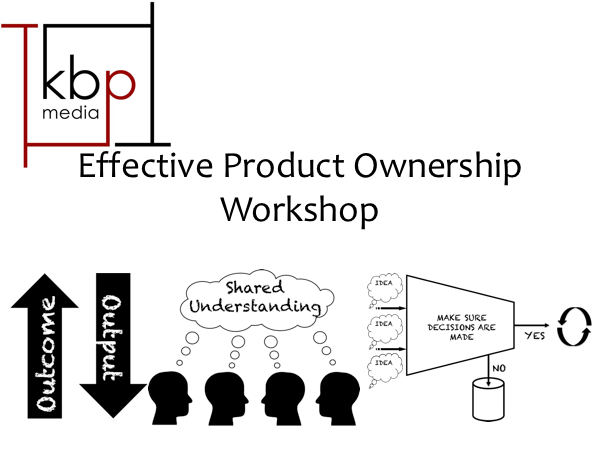 Want the Product Ownership Workshop at Your Organization? Let us know. We’ll be in touch to discuss how the Product Ownership Workshop will work for you.